A bit of confusion regarding reservations, but it was cleared to our satisfaction. The service and dinner was excellent. Food was delicious and presented very well. Love this place! It’s a regular visit for us! Love our waiter, Luis, and the new owner is so sweet! Don’t worry! The chef hasn’t changed! Never a bad meal! Best bruschetta around! We elected to chose from their brunch menu which offered a wide variety of choices. 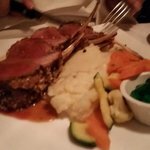 The food was well prepared and the service was excellent. This is a really nice place which we’ll definitely come back to. a tuna sandwich and soup. Cauliflower. Wait another half hour or more. Shrimp arrive. Translucent not cooked. Awful. We should have sent back. My dinner of scallops and lobster risotto very good but was suppose to come w green beans. We asked for green beans. Wait another 10 minutes beans arrive hot but raw. they gave us full menu for desert because of our wait ( we did a pre fix dinner) and choc lava was good. But all in all service was very bad. Bring out 2 appetizers then waiting on the other 2. Same with dinner. Cafe Joelle has new owners that need to help the staff when busy. We will not b going back. Sayville beware. Been to Cafe Joelle? Share your experiences!